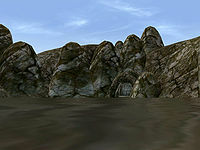 Shallit is a bandit cave on a small island to the east of the Dunmer Stronghold Rotheran. The cave is right at the water front, hidden behind some rocks. 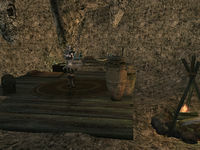 Shallit is the home of a gang of outlaws led by Rels Tenim, whose head is wanted by Hrundi of the Fighters Guild. The cave itself is fairly small but deceptive. Casual examination at ground level leads to a subterranean door that connects to the Drethan Ancestral Tomb, populated by a few undead led by the terrible vampire Marara. A scribbled note informs you of the uneasy deal the bandits made with the vampire, but you'll have to find them. Look up around until you see the ledge that can only be reached by levitation. The gang is hiding there, with Rels Tenim himself in the last room. Conveniently, there are a couple of Bargain Rising Force potions among the crates between the large steps and the adjoining Drethan tomb. Tenim's Bounty: Kill the outlaw Rels Tenim near Vos. There are quite a lot of containers of random loot in here. 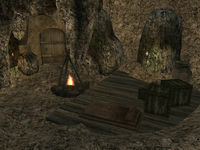 There are also a lot of potions around, including several of Levitation and Feather, as well as a copy of the Block skill book 36 Lessons of Vivec, Sermon 32 and the Long Blade skill book Words and Philosophy, and also a scrawled note detailing Rels's "agreement" with the denizens of the neighboring tomb. This page was last modified on 12 October 2018, at 23:25.